If the FAQ did not have the answer to your questions, Please contact us via email support@similarityapp.com to get an answer question. What comparison methods does Similarity use? 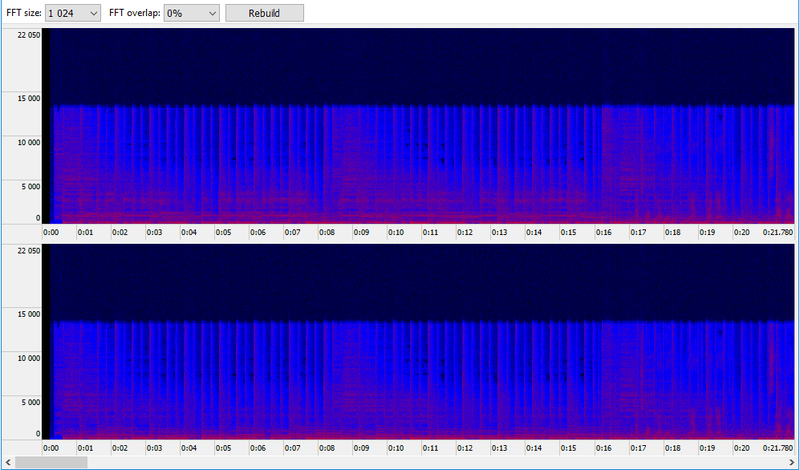 What audio-formats does Similarity support? What is included into the Premium version? What versions does my Premium license cover? Where can I enter the purchased Premium version key? 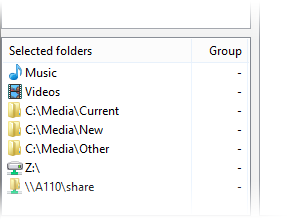 What do group numbers mean when I select folders for comparison? How can I delete/move/ignore files from the result window? How can I perform mass operations over duplicates in the result window? What is the purpose of marking files? Where are all those functions: automark, sonogram, analysis, ... ? Is Similarity limited with folders only when it scans for duplicates? What is the maximum of files Similarity can scan? How can increase the speed of scanning? What is the difference between the precise comparison algorithm and the usual compare by contents algorithm? Why is the DirectShow decoder disabled by default? Why do I have too many duplicates in the result table? 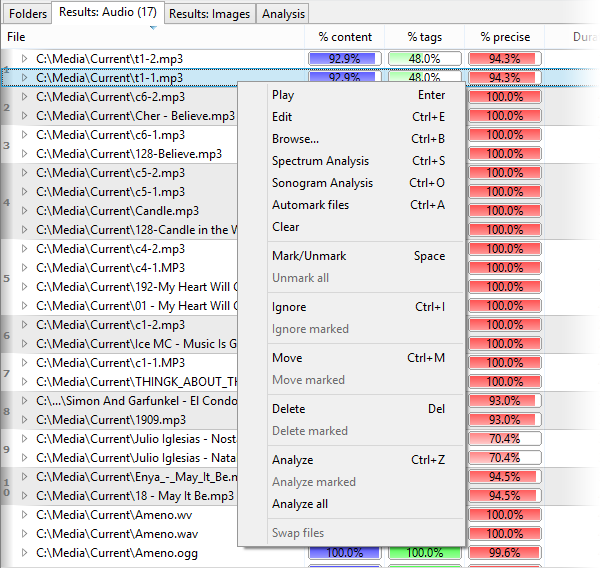 What is a file analysis for? 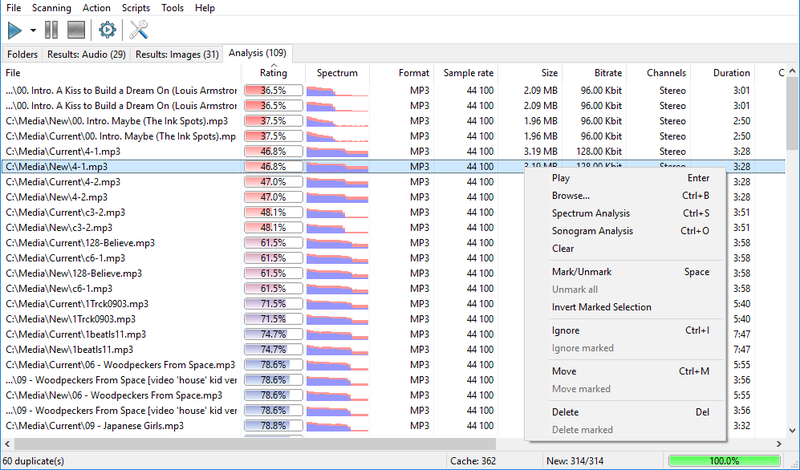 What do numbers in the file analysis list mean? Is there a Mac or Linux version of Similarity? 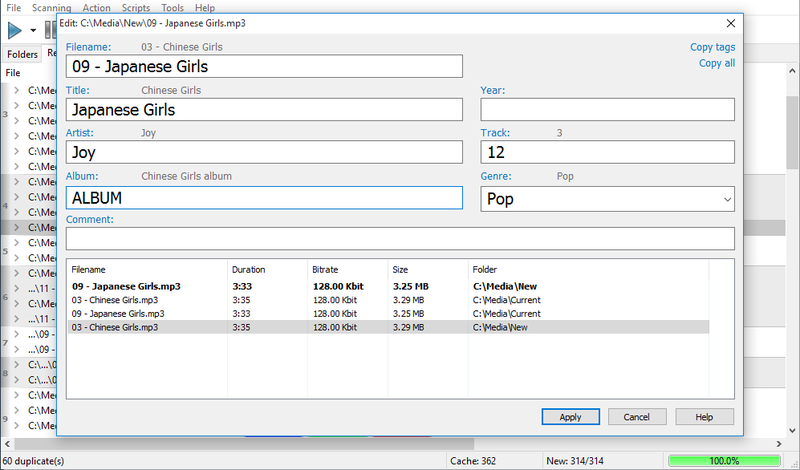 Similarity is an extremely useful program that helps you to reorganize your music/image collection and bring some order to it. It contains a tag editor, a tag converter, a powerful mechanism of searching duplicates (based both on the simple tag comparison and on complex algorithms of "acoustic fingerprint"), a musical collection quality analysis system. In the future, the functionality will be extending, gaining more and more useful capabilities. Similarity uses several comparison methods: by audio-file tags and also methods, based on the "acoustic fingerprint" technology. The "acoustic fingerprint" technology strongly differs from usual binary comparison or comparison of file hashes. Audio-files cannot be compared byte by byte, as most of them aren’t 100% byte copy of each other. They usually have different file size, different bit-rate and even different codec. That is why Similarity sticks to "acoustic fingerprint" technology. This method based on the strong math shows perfect results. Yes, the base functionality of the program is absolutely free and is not time limited. 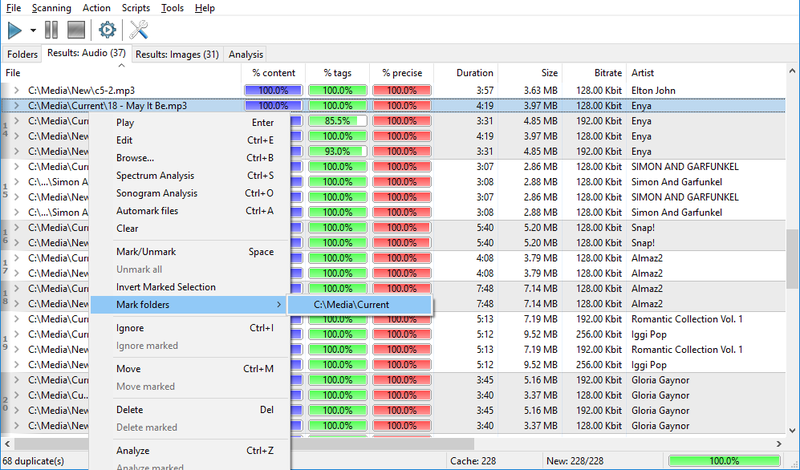 In the free version you can find duplicates, move or delete them, edit tags, perform mass operations, etc. The extended functionality is available in the Premium version. Here you can learn about Premium version. The program will work with all versions released up to the moment of the purchase, and all versions after that within the free update period (1 year or 3 years). 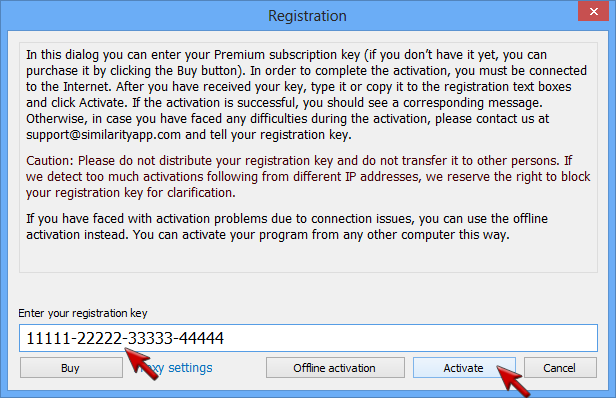 This means you can activate your version of the program at any time. By selecting a group number you specify what files Similarity should compare the current file with. Files of the same group are never compared with each other, but are always compared with files in other groups. Therefore you can put your main collection into one group and all potentially new files into another group, or use more complex approach. 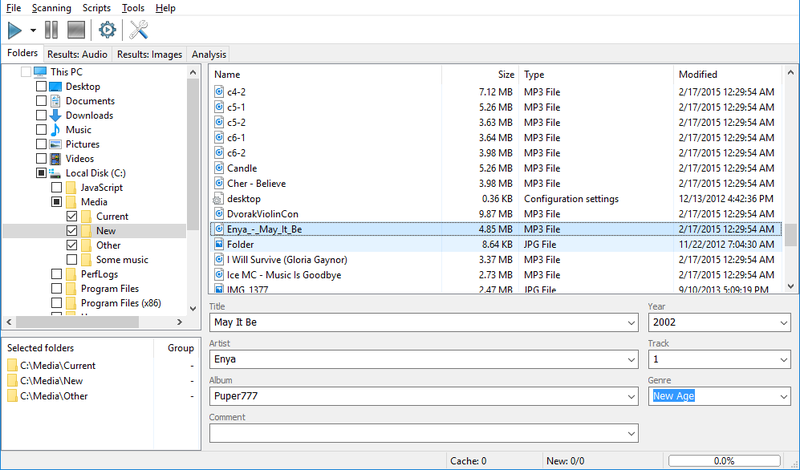 The special group named "None" chosen by default means all files in it are always compared with other files, no matter what group they are in (with other files in the "None" group too). The group number itself is taken into account only when you use the Automark function. Group sorting treats files with smaller group numbers as better ones. Use a context menu or main menu. You can bring context menu up right-clicking the result list, or by pressing the special key on your keyboard. All basic functions work just like in Windows Explorer: hold Shift/Ctrl and select the beginning and the end of your selection with the mouse or with the arrow keys on your keyboard. If the amount of duplicates is significant, it may be difficult to select files with the mouse and the keyboard. That is why we have implemented marking. Marked files are displayed in dark red color, and you can mark any number of files. Then you can apply any mass operation to all marked files. All the above functions are available through the context menu in the result list (mouse right-click or a context menu key on the keyboard) or via the "Action" menu. No, it can scan any devices, disks, network folders or Windows 7 libraries. You can select any of them in a folder tree. It is limited with the amount of free RAM on your computer. 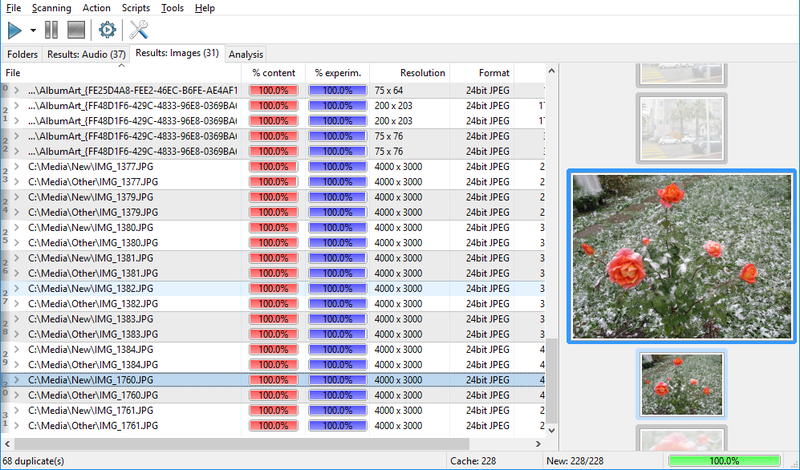 In a 32-bit version, with 2Gb RAM Similarity can scan up to about 100,000 files. 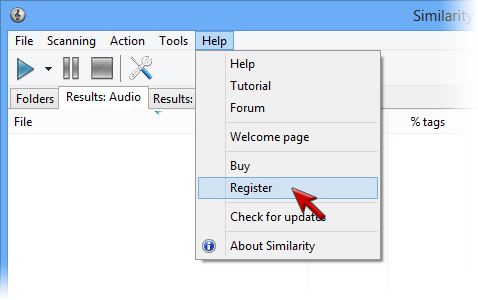 To process more files, we recommend using 64-bit version of Similarity. 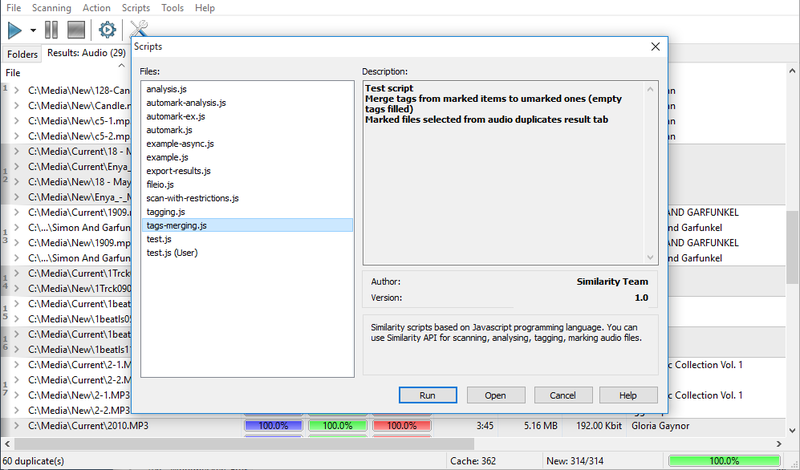 Similarity is a true multitask application; it uses all processors and cores on your computer, so the more processors/cores your computer has, the faster the scan is performed. Also, to improve the scan speed a bit more, you can limit the scan area with folder groups. This function is only available in the Premium version. The precise algorithm is only available in the Premium version. This algorithm includes all our research and developments for the whole time of our work under Similarity. As the name states, this algorithm features much more accurate and fast comparison. Also, it is based on another math method than the old algorithm was which allows us to include even more complex and accurate comparison option in the future. 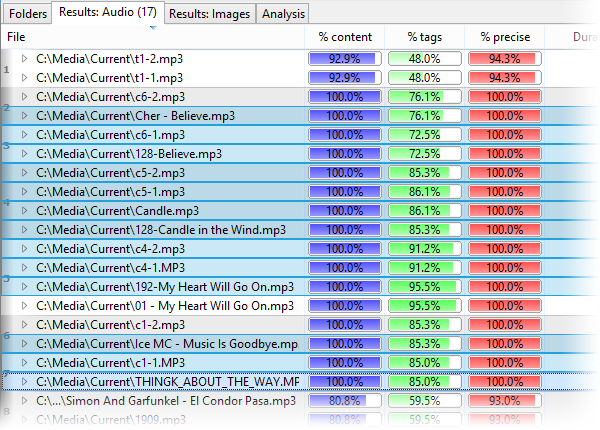 Anyway, these two algorithms (the old and the new one) combined together give almost 100% accuracy in determining the duplicate music files. Prior to comparing files, the program first decodes them to the base non-encoded audio format. 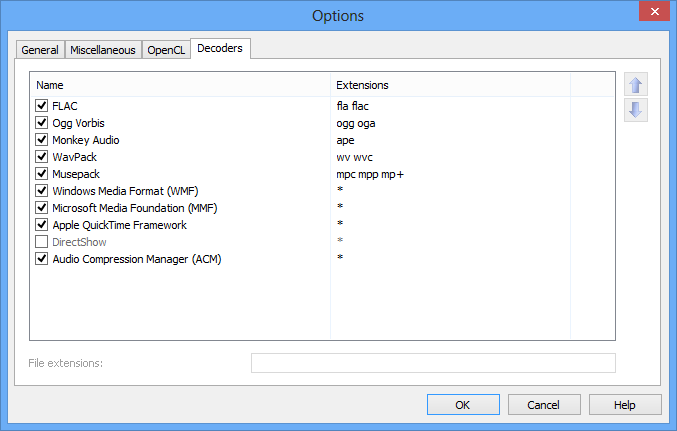 There are many decoders doing that; some of free decoders are built into the program, others are imported from Windows components. The DirectShow technology gives an unlimited number of supported formats, for instance, you can install ffdshow, CoreAVC and many other DirectShow filters to support additional audio formats. Read below to learn how you can turn on the DirectShow decoder. 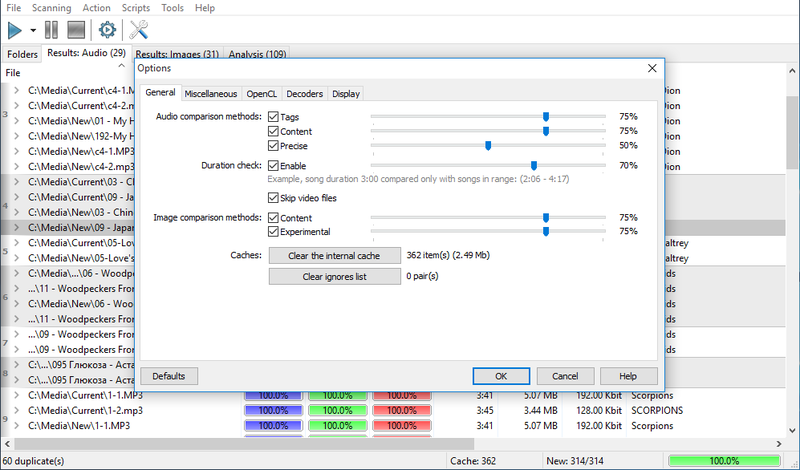 Despite DirectShow features unlimited audio formats support, this option increases the risk of technical issues and crashes of the program at the same time. DirectShow decoders are written by third-party developers, and we cannot guarantee that all of them were tested accordingly and that they will work correctly with a true multi-thread application like Similarity. To reduce the risk of technical problems, we have disabled the DirectShow decoder by default. You can turn it on at any time: simply open the "Options" window, switch to the "Decoders" tab and turn on the DirectShow decoder, then click the OK button. This will turn the DirectShow decoder on. If you experience any problems with it, you can turn it off using the same steps. Turn off tag comparison. The reason for that is that large amounts of files lead to higher probability of information intersection between tags, or of the amount of tags filled incorrectly. This in its turn leads to an exponential growth of the number of results. Increase threshold values for the content comparison. This will reduce the probability of false positives. 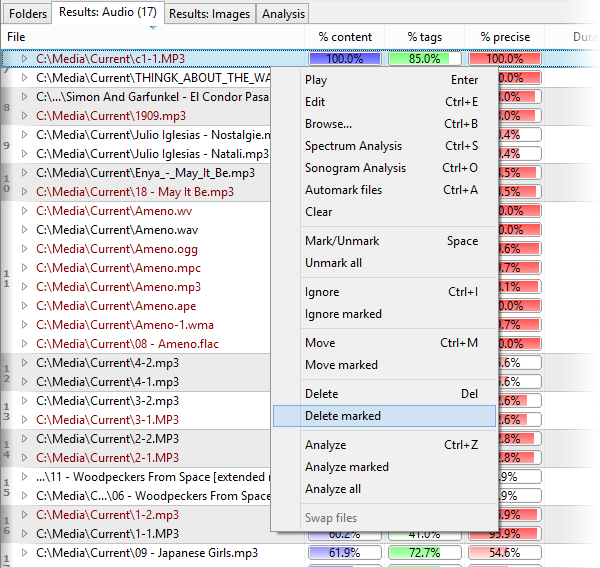 The file analysis helps you locating corrupted or problematic musical files in your collection. 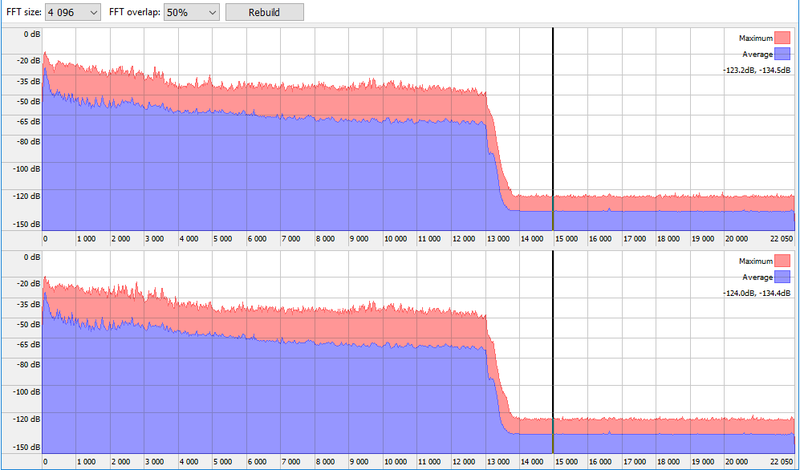 Many files in Internet contain some kind of a problem: low bitrate, encoding artifacts, or quality loss due to conversion. That’s why you should check your files’ quality to keep your collection in the best possible state. Please refer to the file quality analysis article for more info. Please refer to the file quality analysis article for more info. Yes, the Mac version is already available, and the Linux version is also planned. We tried to make a stable and reliable product, but we can’t predict each and every possible environment of a system. Also, the software uses third-party Windows components that may also have bugs. In any case, if something went wrong, please don’t hesitate to write to us to support@similarityapp.com, we will answer.